This is a life-size cardboard cutout of Dwayne Johnson, also known as "The Rock". This cutout depicts him working for WWE, World Wrestling Entertainment. The Rock is not only a wrestler for WWE but is an actor starring in many movies and occasionally TV shows. He is very popular because of his many talents in acting and wrestling. 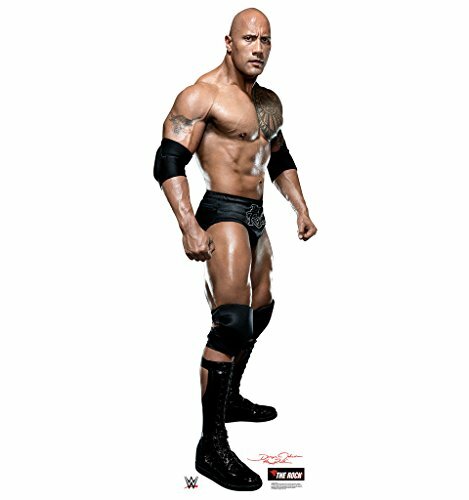 Purchase your own Dwayne "The Rock" Johnson cardboard cutout today! Size: 76" x 26". How to Set Up Your Standup: 1. Unfold standup and easel. Lay standup face down on a clean, flat surface. 2. Fold easel up along the long vertical crease that runs the length of the standup. 3. Lift upper and lower tab to lock easel in place. 4. Attach upper tab to top of easel. About Advanced Graphics: Since 1984, Advanced Graphics has been committed to producing the highest quality Cardboard Standups and Custom Prints in the world. We are the worldwide industry leader in the licensing and distribution of Cardboard Standups. We are also the #1 source for Licensed and Custom cardboard standups in the industry. Our goal is to provide the highest quality prints to our customers. We put our customers first and will continue to provide the best customer service to those who keep us in business. This is a cardboard cutout of Alexa Bliss (WWE). It features a singled-sided high quality print on cardboard with an easel on the back so it can stand on its own. Cardboard cutouts make great decor for parties, photo ops and events! Order yours today! Size is: 62" x 25". How to Set Up Your Standup: 1. Unfold standup and easel. Lay standup face down on a clean, flat surface. 2. Fold easel up along the long vertical crease that runs the length of the standup. 3. Lift upper and lower tab to lock easel in place. 4. Attach upper tab to top of easel. About Advanced Graphics: Since 1984, Advanced Graphics has been committed to producing the highest quality Cardboard Standups and Custom Prints in the world. We are the worldwide industry leader in the licensing and distribution of Cardboard Standups. We are also the #1 source for Licensed and Custom cardboard standups in the industry. Our goal is to provide the highest quality prints to our customers. We put our customers first and will continue to provide the best customer service to those who keep us in business. 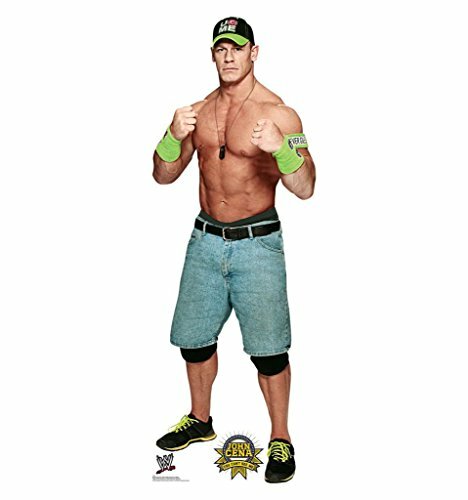 Life-size cardboard standup of John Cena in navy and gold from WWE stands at a size of 74" x 25". John Cena is a WWE professional wrestler. Cena's ring name is The Prototype. Cena has won many championships and awards. John Cena is a great wrestler. Who wouldn't want a giant life-size cardboard cutout of an actual person? Get your standup of Cena today! How to Set Up Your Standup: 1. Unfold standup and easel. Lay standup face down on a clean, flat surface. 2. Fold easel up along the long vertical crease that runs the length of the standup. 3. Lift upper and lower tab to lock easel in place. 4. Attach upper tab to top of easel. About Advanced Graphics: Since 1984, Advanced Graphics has been committed to producing the highest quality Cardboard Standups and Custom Prints in the world. We are the worldwide industry leader in the licensing and distribution of Cardboard Standups. We are also the #1 source for Licensed and Custom cardboard standups in the industry. Our goal is to provide the highest quality prints to our customers. We put our customers first and will continue to provide the best customer service to those who keep us in business. This is a cardboard cutout of Roman Reigns (WWE). It features a singled-sided high quality print on cardboard with an easel on the back so it can stand on its own. Cardboard cutouts make great decor for parties, photo ops and events! Order yours today! Size is: 75" x 32". How to Set Up Your Standup: 1. Unfold standup and easel. Lay standup face down on a clean, flat surface. 2. Fold easel up along the long vertical crease that runs the length of the standup. 3. Lift upper and lower tab to lock easel in place. 4. Attach upper tab to top of easel. About Advanced Graphics: Since 1984, Advanced Graphics has been committed to producing the highest quality Cardboard Standups and Custom Prints in the world. We are the worldwide industry leader in the licensing and distribution of Cardboard Standups. We are also the #1 source for Licensed and Custom cardboard standups in the industry. Our goal is to provide the highest quality prints to our customers. We put our customers first and will continue to provide the best customer service to those who keep us in business. 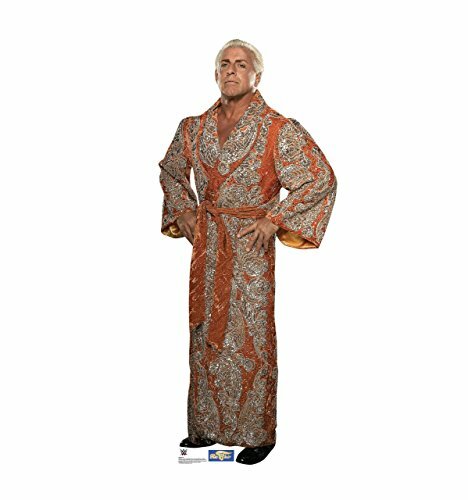 This is a cardboard cutout of Ric Flair (WWE). It features a singled-sided high quality print on cardboard with an easel on the back so it can stand on its own. Cardboard cutouts make great decor for parties, photo ops and events! Order yours today! Size is: 73" x 30". How to Set Up Your Standup: 1. Unfold standup and easel. Lay standup face down on a clean, flat surface. 2. Fold easel up along the long vertical crease that runs the length of the standup. 3. Lift upper and lower tab to lock easel in place. 4. Attach upper tab to top of easel. About Advanced Graphics: Since 1984, Advanced Graphics has been committed to producing the highest quality Cardboard Standups and Custom Prints in the world. We are the worldwide industry leader in the licensing and distribution of Cardboard Standups. We are also the #1 source for Licensed and Custom cardboard standups in the industry. Our goal is to provide the highest quality prints to our customers. We put our customers first and will continue to provide the best customer service to those who keep us in business. 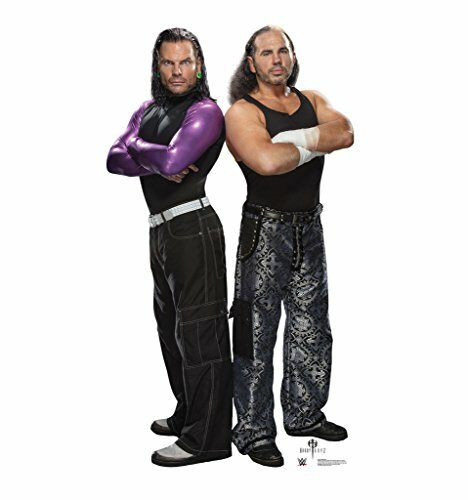 This is a cardboard cutout of The Hardy Boyz (WWE). It features a singled-sided high quality print on cardboard with an easel on the back so it can stand on its own. Cardboard cutouts make great decor for parties, photo ops and events! Order yours today! Size is: 74" x 41". How to Set Up Your Standup: 1. Unfold standup and easel. Lay standup face down on a clean, flat surface. 2. Fold easel up along the long vertical crease that runs the length of the standup. 3. Lift upper and lower tab to lock easel in place. 4. Attach upper tab to top of easel. About Advanced Graphics: Since 1984, Advanced Graphics has been committed to producing the highest quality Cardboard Standups and Custom Prints in the world. We are the worldwide industry leader in the licensing and distribution of Cardboard Standups. We are also the #1 source for Licensed and Custom cardboard standups in the industry. Our goal is to provide the highest quality prints to our customers. We put our customers first and will continue to provide the best customer service to those who keep us in business. Stone Cold is a WWE, World Wrestling Entertainment, Champion, Intercontinental Champion and World Tag Team Champion. He was named the King of the Ring in 1996 and is the Royal Rumble Match winner. He is also a WCW U.S. Champion and a WCW Tag Team Champion. On top of all that, in 2009 he became a WWE Hall of Fame Inductee. What a talented wrestler! Order your awesome standup of Stone Cold now! Size is 74" x 30". How to Set Up Your Standup: 1. Unfold standup and easel. Lay standup face down on a clean, flat surface. 2. Fold easel up along the long vertical crease that runs the length of the standup. 3. Lift upper and lower tab to lock easel in place. 4. Attach upper tab to top of easel. About Advanced Graphics: Since 1984, Advanced Graphics has been committed to producing the highest quality Cardboard Standups and Custom Prints in the world. We are the worldwide industry leader in the licensing and distribution of Cardboard Standups. We are also the #1 source for Licensed and Custom cardboard standups in the industry. Our goal is to provide the highest quality prints to our customers. We put our customers first and will continue to provide the best customer service to those who keep us in business. This is a life-size cardboard cutout of the WWE professional wrestler, Roman Reigns. Roman Reigns is a professional wrestler for WWE. He has won many awards for his matches. Roman Reigns is a great wrestler and his standup would be a great gift for WWE fans. Purchase yours today! How to Set Up Your Standup: 1. Unfold standup and easel. Lay standup face down on a clean, flat surface. 2. Fold easel up along the long vertical crease that runs the length of the standup. 3. Lift upper and lower tab to lock easel in place. 4. Attach upper tab to top of easel. About Advanced Graphics: Since 1984, Advanced Graphics has been committed to producing the highest quality Cardboard Standups and Custom Prints in the world. We are the worldwide industry leader in the licensing and distribution of Cardboard Standups. We are also the #1 source for Licensed and Custom cardboard standups in the industry. Our goal is to provide the highest quality prints to our customers. We put our customers first and will continue to provide the best customer service to those who keep us in business. 10 Shocking WWE Moments CUT From Broadcast! Looking for more Wwe Cut Out similar ideas? Try to explore these searches: Electric Paper Drill, Logo Pendant Necklace Nfl Football, and Hybrid Phone Cover. Shopwion.com is the smartest way for comparison shopping: compare prices from most trusted leading online stores for best Wwe Cut Out, Wooden Luggage Rack, Auto Chronograph, Wwe Cut Out . Don't miss this Wwe Cut Out today, April 19, 2019 deals, updated daily.